Sometimes nature’s best is just outside your window. 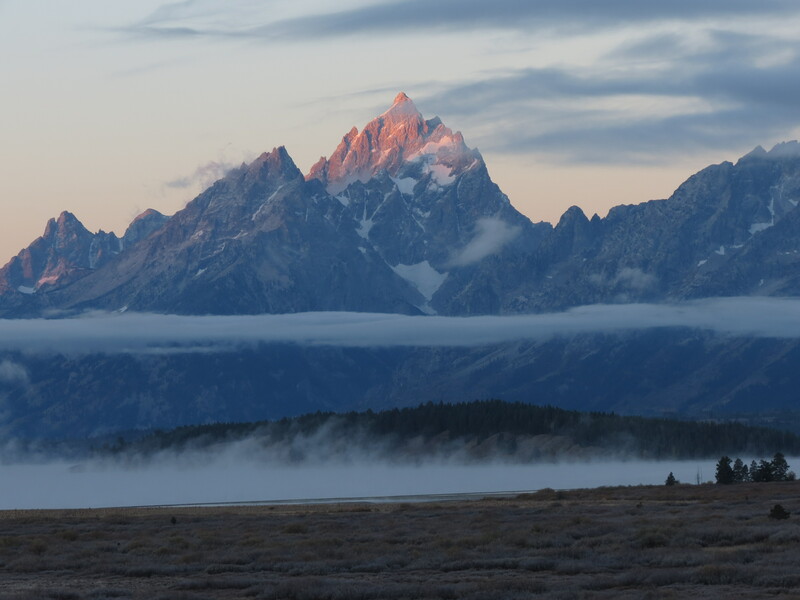 Such was the case in the Grand Tetons. It pays to be married to a photographer. Especially one with a passion for night time photography and the sun’s golden hours. I may not be game for his all-night antics chasing the Aurora, but sunsets and sunrises I can handle. And I have to admit, Rich does his homework. 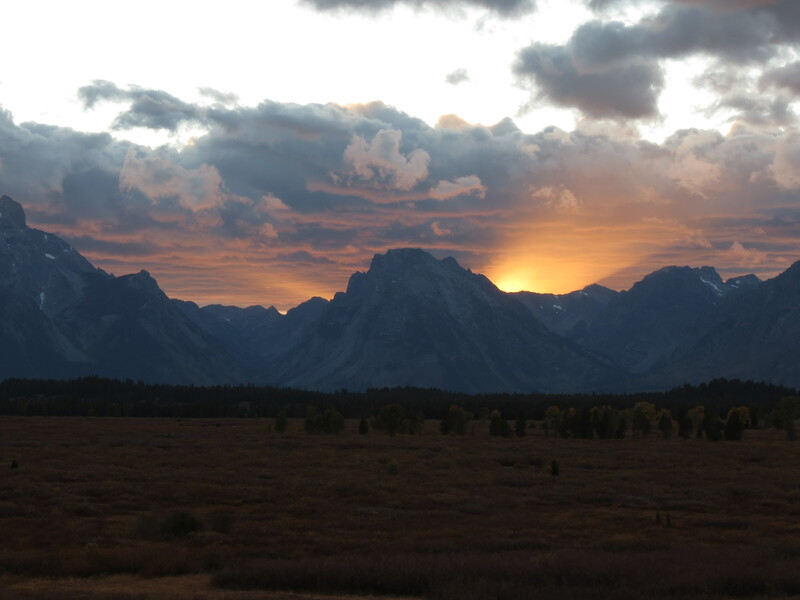 Upon arriving at Jackson Lake Lodge, Rich quickly scouted the mountain views from the front of the lodge, his apps that detailed the exact location of sun movement, and the weather forecast. He deemed it a perfect sunset opportunity. We were poised and ready with our cameras and tripods well before the action began. An darn if he wasn’t spot on! We spent a magical hour watching the pageantry of the receding sun, as it shot light rays from behind the mountains and spun color into the clouds overhead. We knew it must be something special when we spotted numerous lodge staff members dashing outside to capture pictures of the display. I could have been thoroughly satisfied with that experience. But it was far from over. 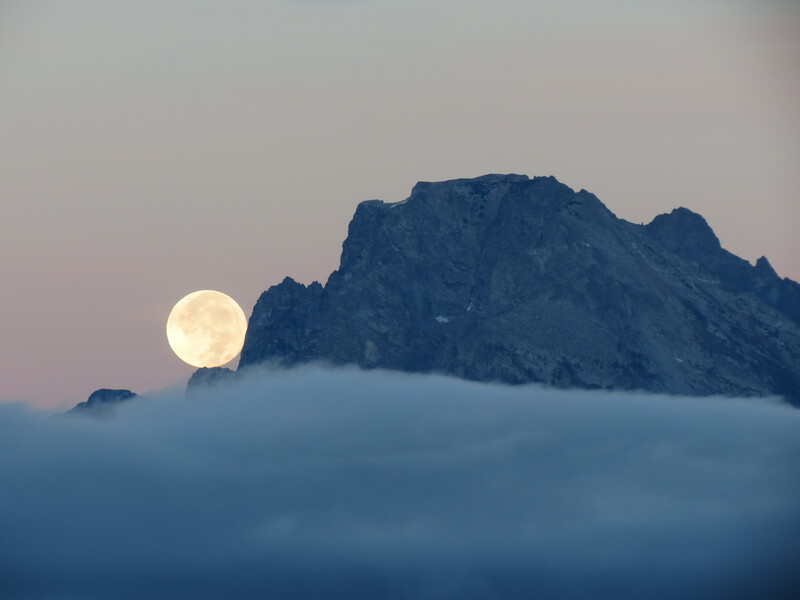 I was informed that we had a full moon, and it was due to set over the mountains early the next morning. It was a once-a-month phenomenon. And we had the good fortune to see it. So it was that I dragged my body out of bed in the dark and chill of pre-dawn the following morning. And heck, that too was worth the effort! It wasn’t long from the conclusion of that drama to the sun’s appearance, so we lingered for the final show. 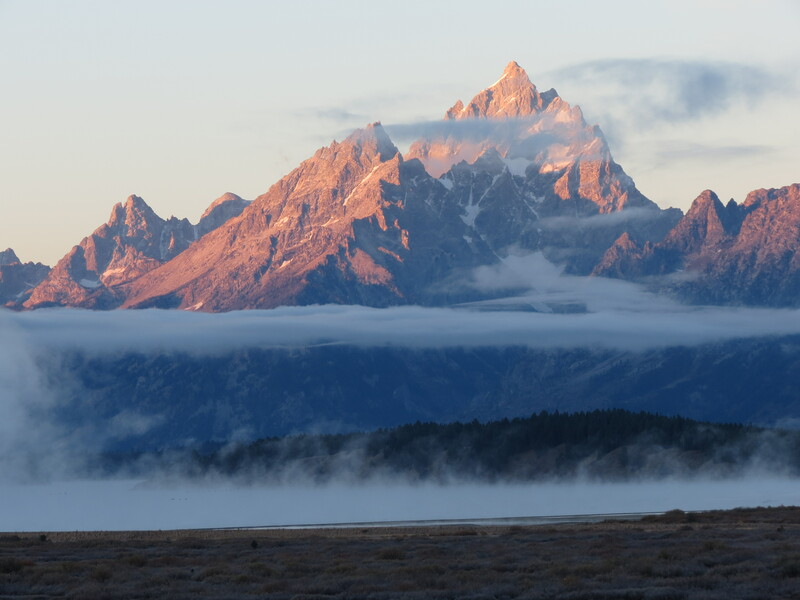 Rising from behind, it slowly painted the mountaintops and slithered down the rocky slopes with pinky golden colors, ultimately meeting the mist rising from Jackson Lake. It was the perfect trifecta. 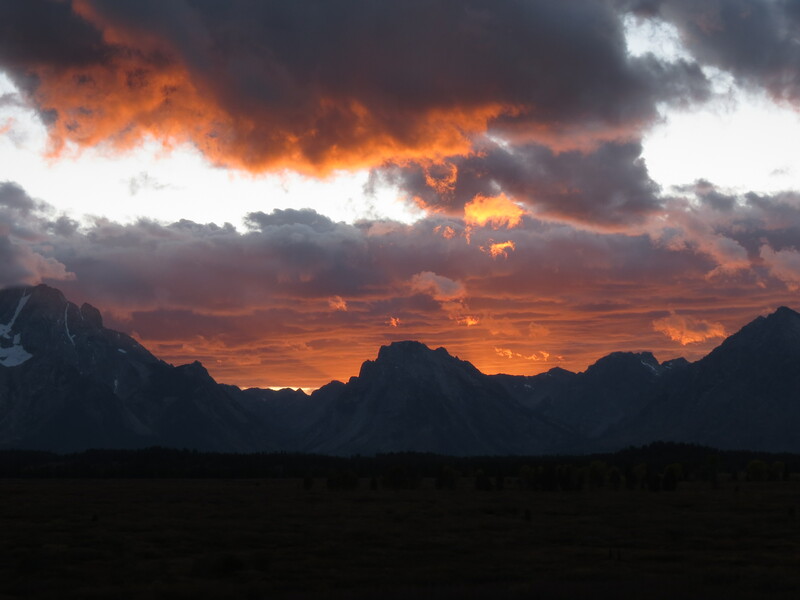 Three heavenly performances initiated our visit to the Grand Tetons. And the view in broad daylight wasn’t half bad either. “Let's go rainbow hunting!” That was Rich. We were holed up in our modest motel room, waiting out the first rain of our trip. 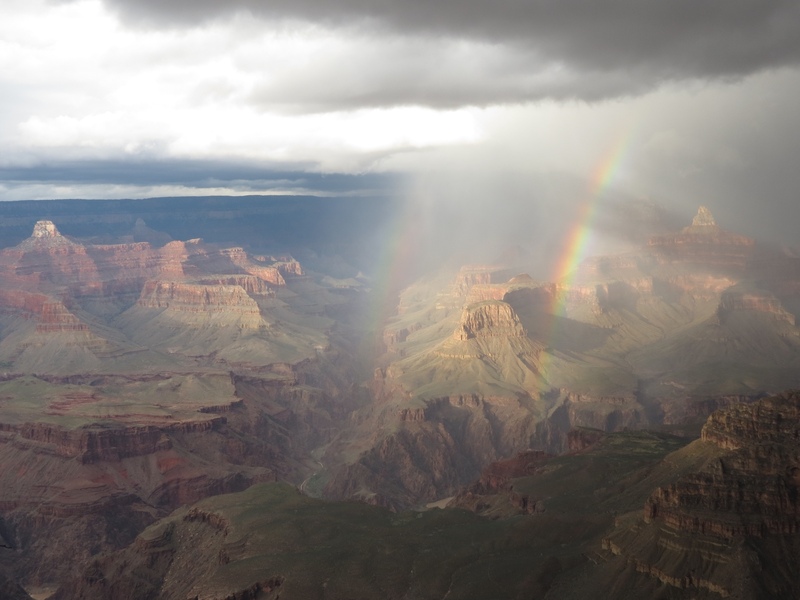 He had visions of photographing a beautiful rainbow arching over the Grand Canyon. I was skeptical. Rich has overly-optimistic tendencies. But it beat sitting in the room, so I took the bait. 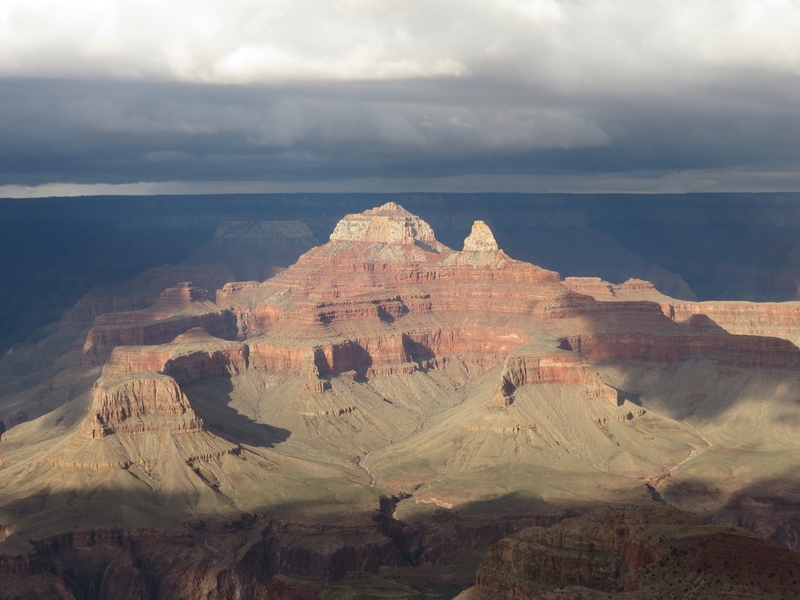 Arriving at our favorite spot at Yavapai Point during a lull from the rain, the sun was glowing on the canyon formations while ominous clouds gathered overhead. Rich was quick to point out that while blue sky days are pretty, the more interesting shots come with unusual weather conditions. Weather indeed was headed our way. The dark clouds behind us advanced with rumbles of thunder. 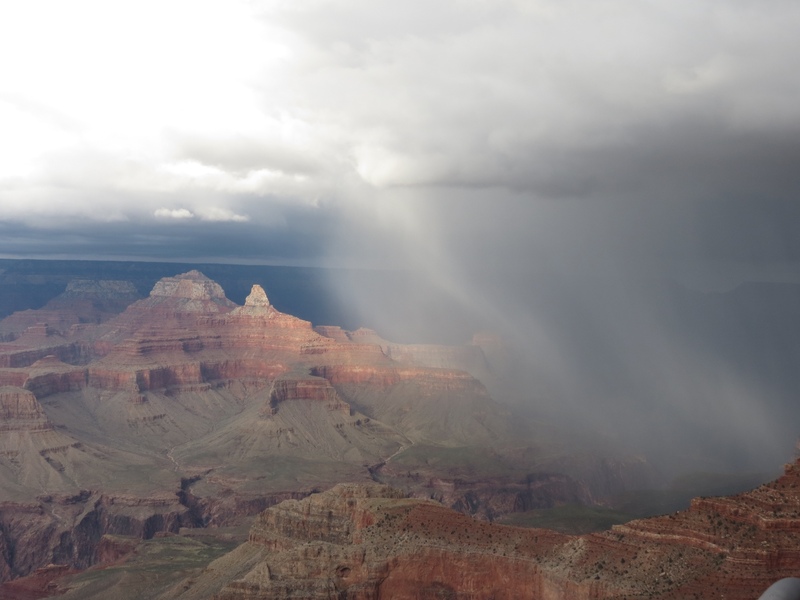 Rain began crossing the canyon. While we were still dry, it was consuming the scene in front of us. Raindrops and lightning ultimately sent us fleeing for cover and safety. Retreating into the nearby Geology Museum, we watched from dry environs. Then suddenly, there it was. Just like Rich thought it would be. A rainbow! Returning outside, we watched as the rainbow extended in length. 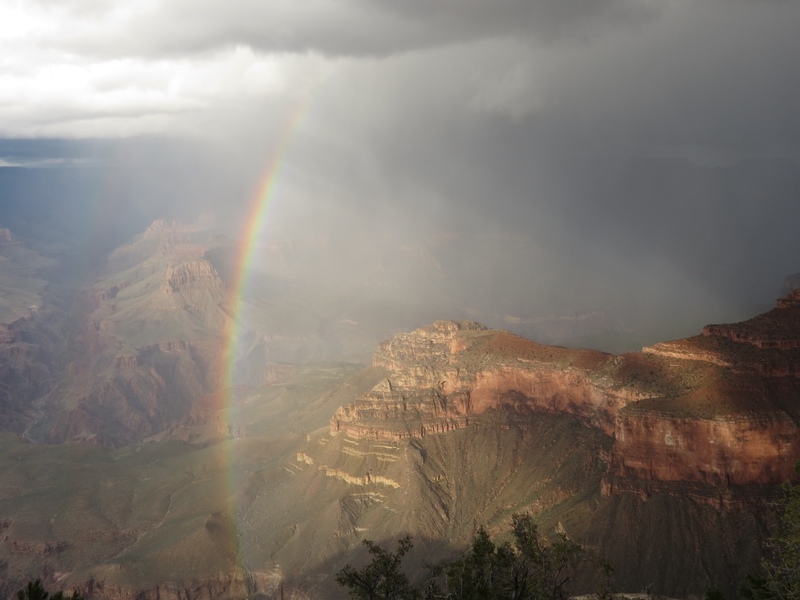 Where it would normally reach the ground, the rainbow continued to arc into the depths of the canyon. Spreading faintly across the entire sky, it completed well more than a half circle. Not only that, but a faint twin developed to its left. The other spectators echoed our excitement over this amazing phenomenon. We all knew we were witnessing something rare and special. We stayed on watching as the rainbow began to shrink. As the sun disappeared. As the storm grew closer again. Soon it was obvious. It was time to run for the car. 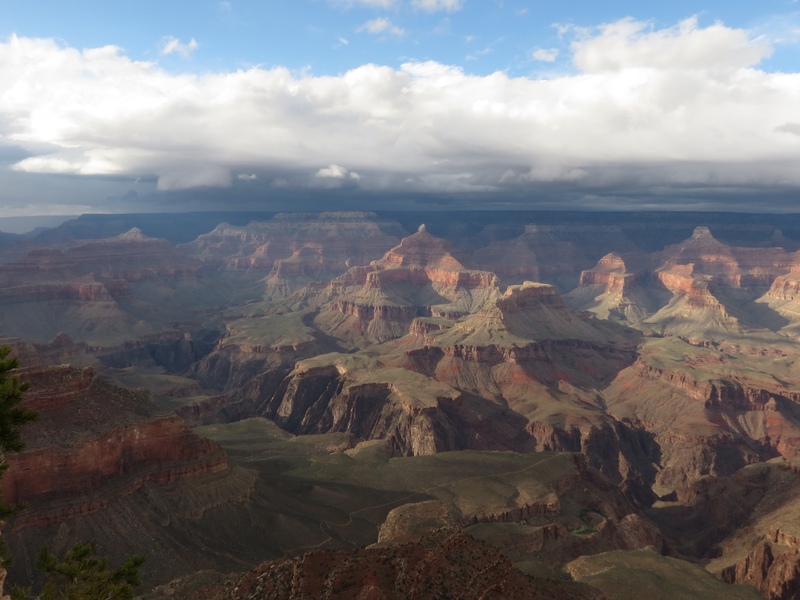 The Grand Canyon was under siege, and so were we. But for once I was glad I was swayed by Rich's instincts. Rainbow hunting indeed. 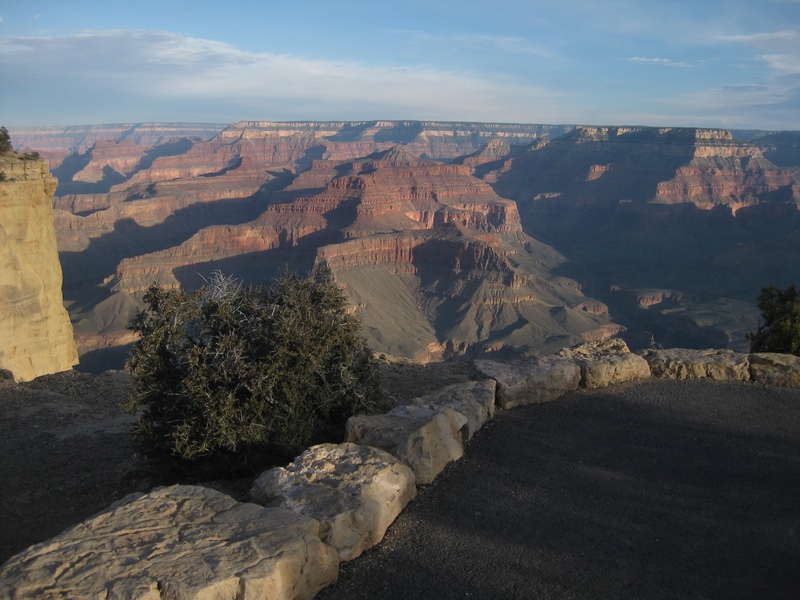 It's taken me 62 years to get to the Grand Canyon, and now I'm wondering why it took so long. 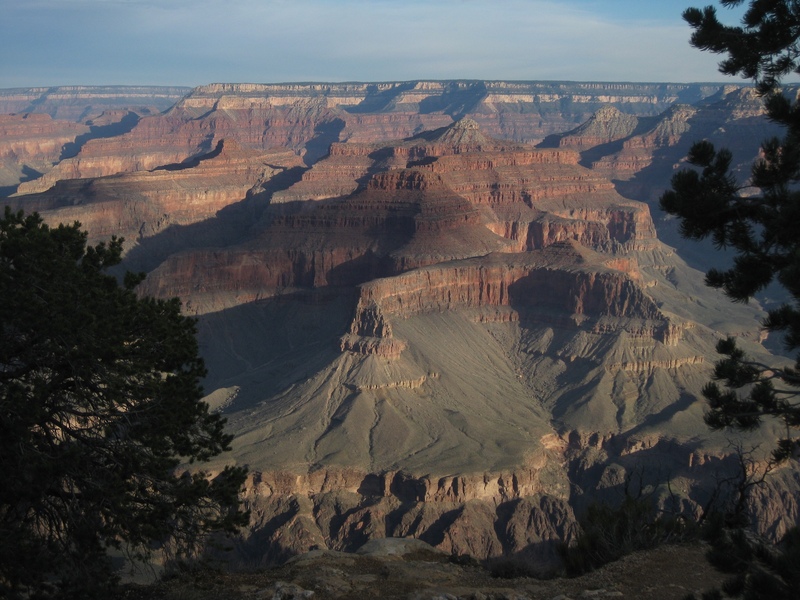 Seeing it for the first time as we cycled along the South Rim, I was naturally awed by its vast expanse, the colors of the strata, its depth and the unearthly rock formations. Each turn gave us a different perspective, new views to behold. 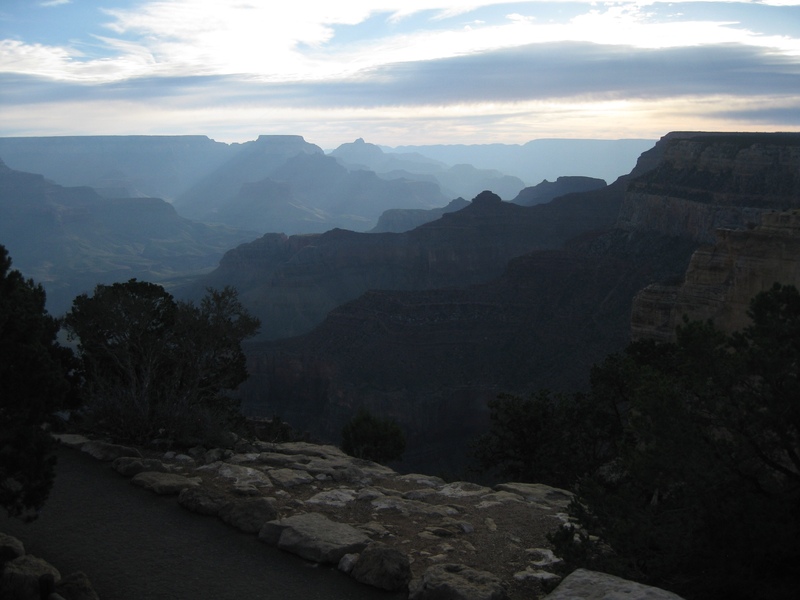 But it paled in comparison to what happened when the sun worked its magic on the canyon. 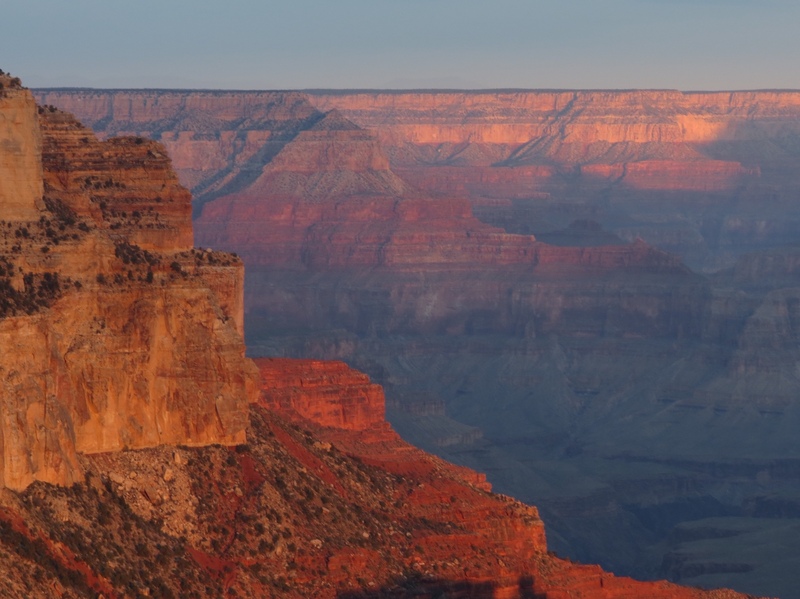 Near sunset, we toted our cameras and tripods to the overlook at Yavapai Point. It was already crowded with people, both photographers and those there just to bask in the view. Although most had already staked out their spots, we had no trouble finding a good vantage point as we planned to shoot in the opposite direction. 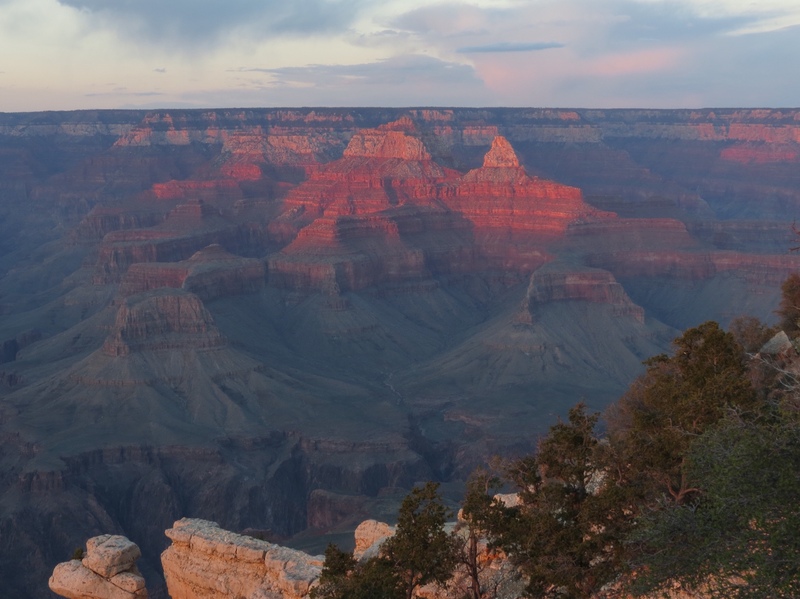 While the sun performed its light tricks in the sky producing brilliant orange and red hues, to us the real display was on the canyon rocks. 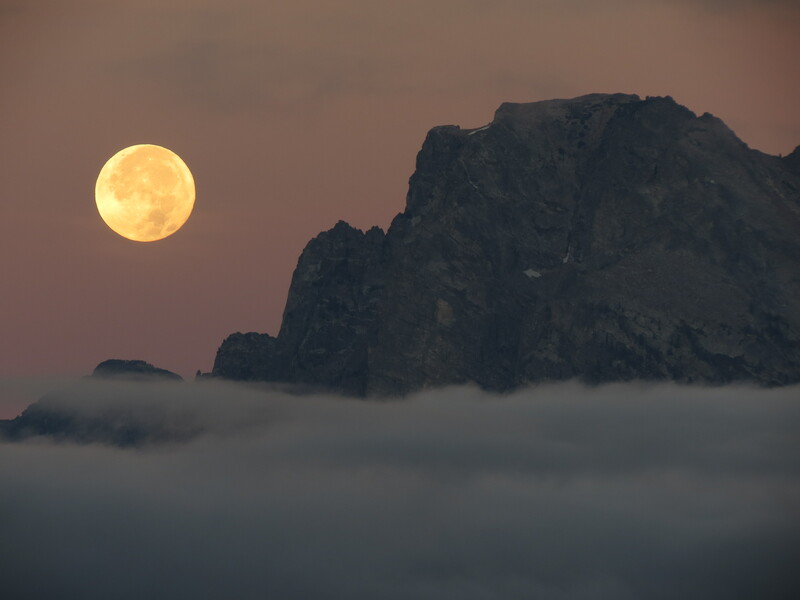 The further the sun sank the greater the glow on the peaks before us. That was the real show. Morning brought a repeat performance. We returned to the same spot, first selecting an East facing view to watch the sun come up. It was more beautiful to watch than what I could capture with my camera. As soon as it crested the horizon, we skedaddled to another position to look West. 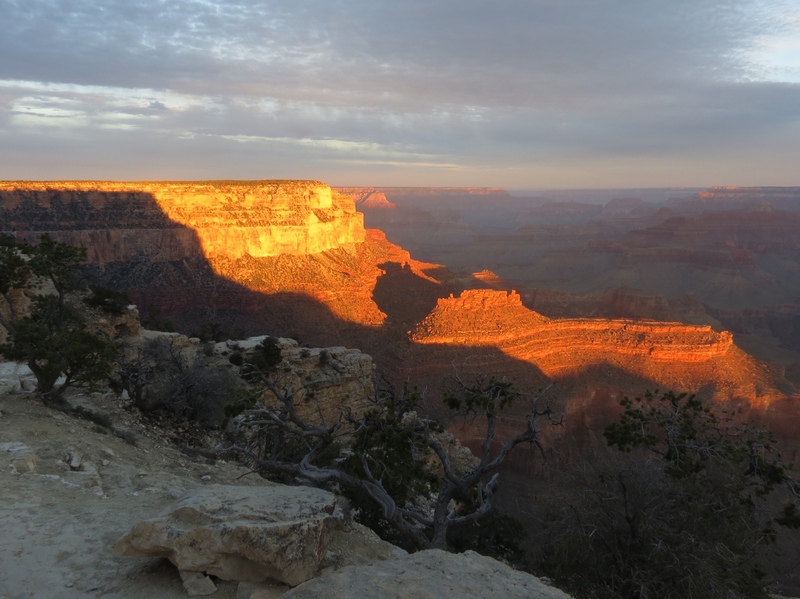 As the sun advanced in the sky, increasing sections of the canyon were illuminated. 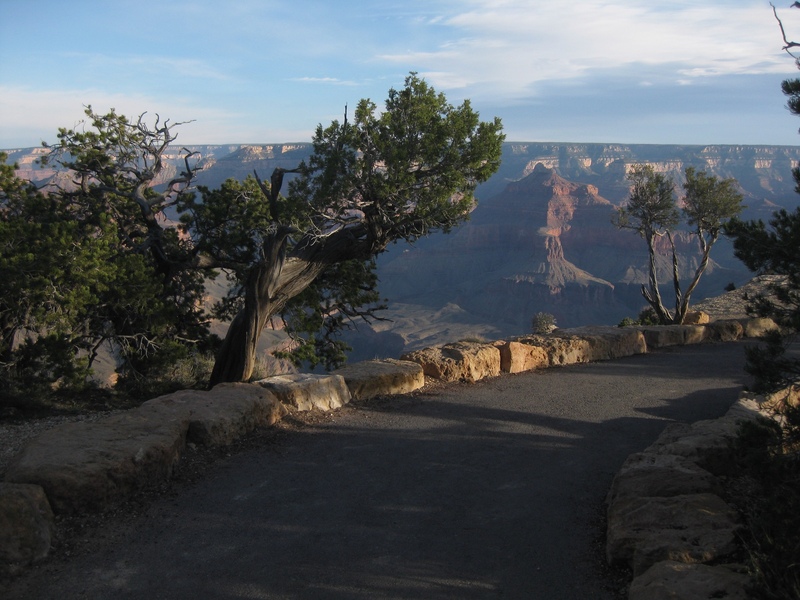 When the light began to wane, I set out on another tour of the canyon. What better place for my morning run than along the paved Rim Trail? Covering five miles out and then back again, I had beautiful views to spur me on. Both the 7,000 foot elevation and some steep sections of trail took their toll, but I had the perfect excuse to stop and catch my breath while snapping photos along the way. I can't think of many more picturesque runs I have done in my life. 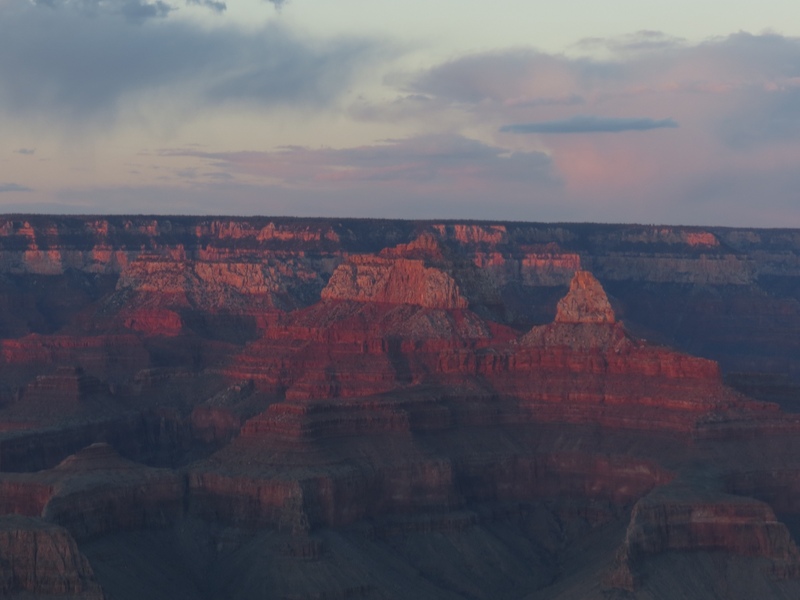 We haven't even been here a full day yet, and already I think we have seen the best the Grand Canyon has to offer. The rest will be pure gravy. 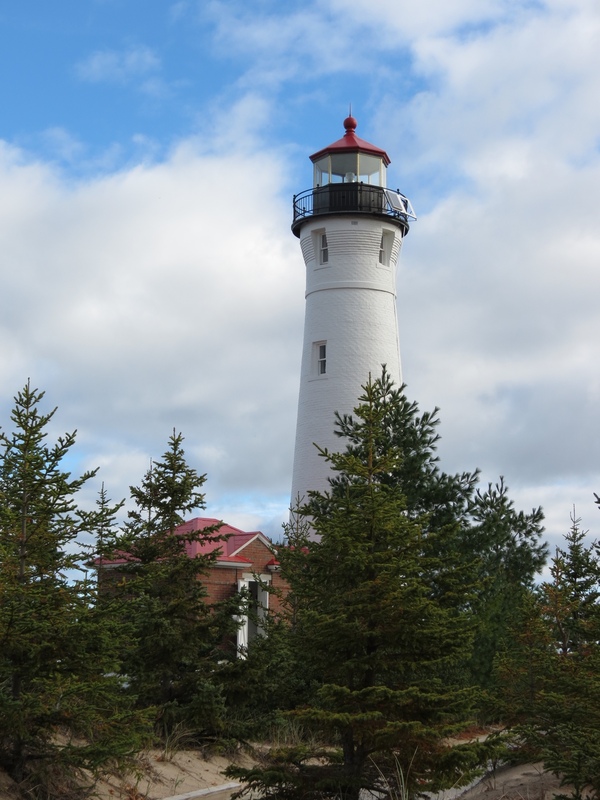 Perched at the top of Crisp Point Lighthouse, I stand out on the catwalk before dawn. A golden glow stretches across the sky between the narrow bands of clouds that cling to the horizon. My hopes for a spectacular sunrise fade as the promise of glowing reds fails to materialize. I am unaware that the rising sun has yet to work its magic. Descending the tower, I set out down the beach. The wind of the past two days has calmed and only residual waves lap the shore. It is only when I turn around away from the sunrise, that I see the first colors of the morning. By the time the pinks and blues fade in the distance, the sun begins to spin gold in the clouds directly overhead. A totally different light show is in progress. This sends me scurrying to the opposite side of the lighthouse. Such a brilliant contrast leaves me marveling at the wonders of a single sunrise. Next I wait for the sun to climb high enough to illuminate the lighthouse itself. Gradually it paints the tower, starting with its red top and slowly migrating downward. In the process it also throws shadows from the towering pines against the white structure. Mother Nature is such an artist! The morning is still young, and already I have witnessed so many reflections of the rising sun. As full daylight develops, I capture the classic blue sky photo. Compared to the earlier drama, it feels quite ordinary. At last the sun begins its other duty, warming the brisk 36-degree air. It's time to start the campstove and make my morning coffee. I'm ready to thaw my hands and inner self. This has been a crisp morning indeed. We are fortunate to live in northern Minnesota where we can see the Northern Lights when the conditions are right. Over the years, I’ve seen my share of Auroras. The very best was up at our cabin. Late at night, sitting around the campfire, someone looked up and noticed the green glow. We all trooped down to the dock where we had a view of the whole sky. There were rays shooting up from all directions, reaching the apex and waving. Lying on our backs to watch the performance was awesome. More commonly, the lights have been a green glow in the North. Sometimes they create spikes that stretch up into the sky. Others form curtains that hang above the landscape like the display I saw in the Boundary Waters with my son Carl. Each is mesmerizing and special. 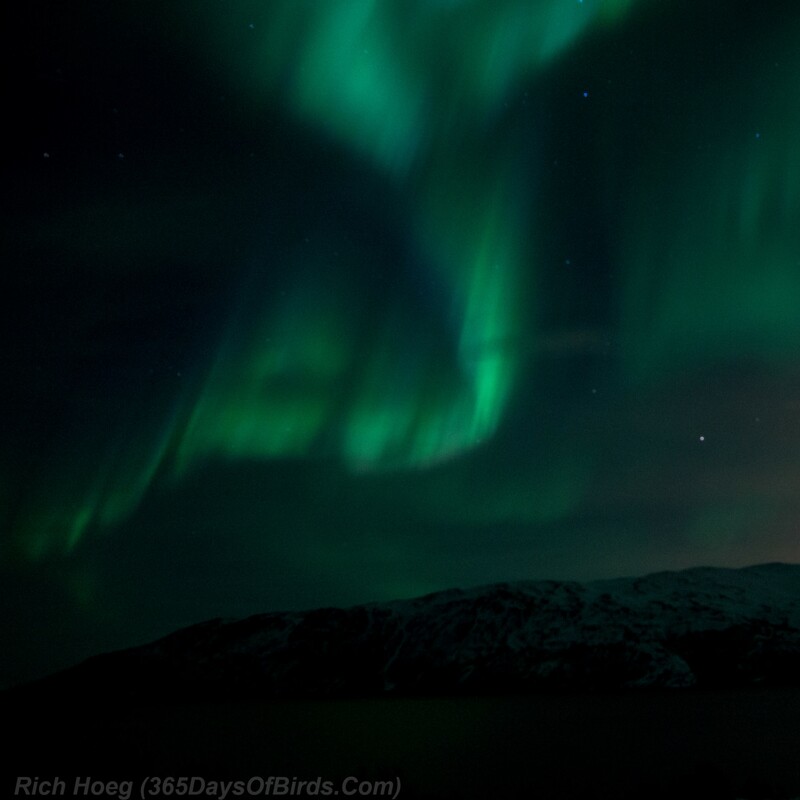 With that as my frame of reference, I was unprepared for the Northern Lights in Norway. Sure, I’d seen photographs and tourism posters, but those are unabashedly sensationalized. I knew the chance of seeing the lights was better there. Pure geography means even weaker displays are visible. I just hadn’t realized how different they would be. Our first night we got really lucky. In the vernacular of the serious Aurora Hunters, there was a “G2 storm” – which means an extraordinary amount of solar magnetic activity. That translates to a high likelihood of seeing the Northern Lights. Not only did the lights blanket the sky, but they were exceptionally brilliant and intense. We didn’t have to look for a green glow. The whole sky was glowing. Against that backdrop bright rays shot across the sky, arcing over our heads and extending from horizon to horizon. It was as if we were witnessing huge electric currents, pulsating and giving off waves of color. Everything was perfectly aligned to bring us this fine display – location, clear skies, no moon and solar power in the atmosphere. And boy, was that obvious. 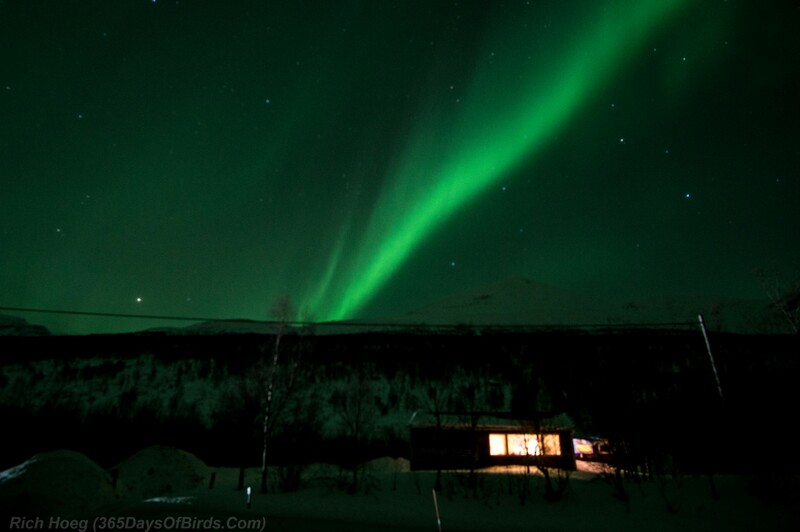 The following night, we knew that the solar activity was weaker, so we adjusted our expectations accordingly. I think we were still harboring a Minnesota frame of reference, because once again we were amazed at what we saw. This time the lights may not have been as intense, but the sharp streaks were replaced by patterns and movement and the performance lasted much longer. For about an hour and a half we watched as the lights danced overhead. They were constantly in motion, creating shapes then morphing into something else. First active on one side of the ski, then picking up momentum on the other. My favorite was the circular curtain of lights, waving its folds and draping its colors as it curved. It was hard to know which way to look, because to view in one direction meant missing something behind me. I have Rich to thank for the photographs of these displays, as that is his specialty. Often times I feel that the camera overstates what I was able to see with my own eyes. But on this occasion, I think that the opposite is true. His photos are quite true to what we saw, yet cannot do justice to the whole experience. Not even his wide angle lens could capture the full image of what was happening up in the sky. You had to be there to see it. 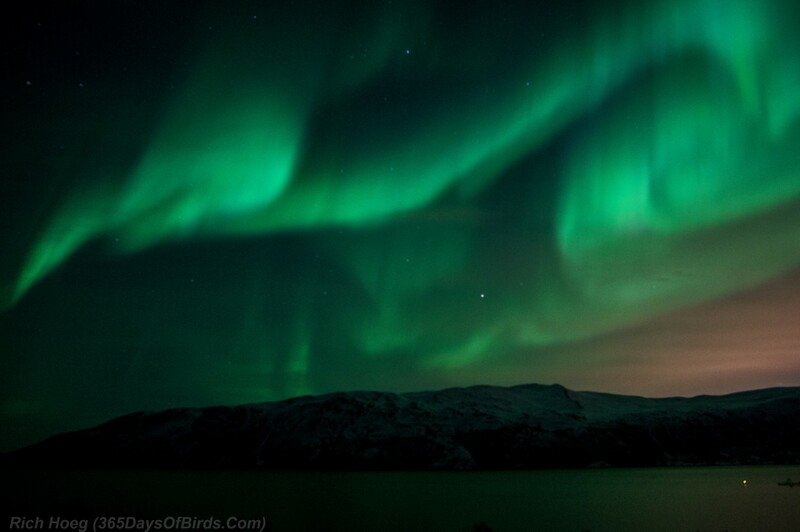 I can now fully appreciate the vast beauty of just what the Northern Lights can do. 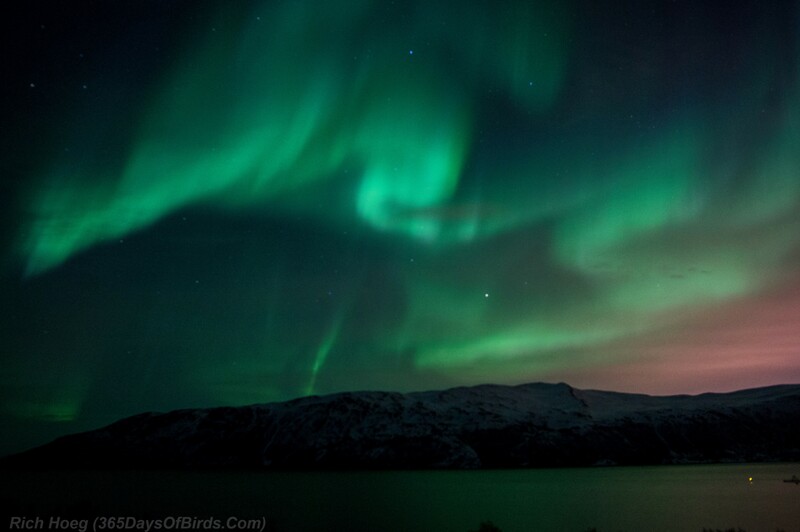 And it is abundantly clear that not all Auroras are equal. I’m convinced that we saw some of the best.